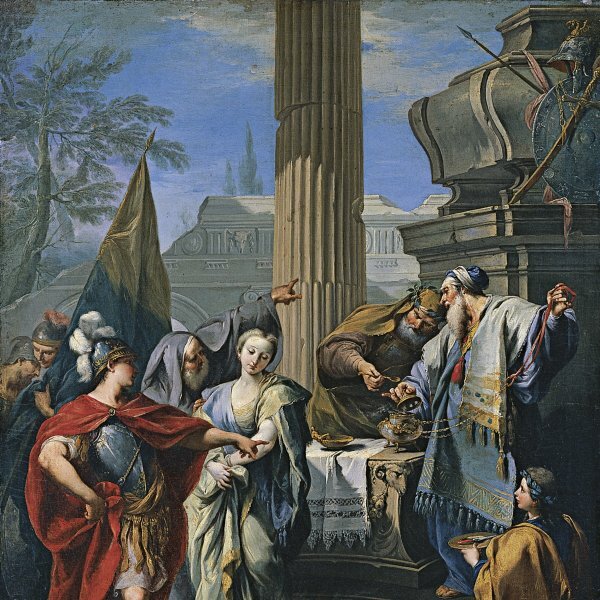 In the late 1730s Giambattista Tiepolo worked on the decoration of various churches including San Antonio in Padua, for which he painted The Martyrdom of Saint Agatha. For Santa Maria del Rosario in Venice, better known as the church of the Gesuati, he executed The Apparition of the Virgin to Saint Dominic, The Instruction of the Rosary and The Glory of Saint Dominic. This project was followed by a series of works for Sant’Alvise, for which he painted a large triptych on the Passion of Christ. During these years his fame increased together with the number of commissions that he received and in the late 1730s his style underwent a transformation with dark tones and a use of pronounced contrasts replaced by lighter shades. 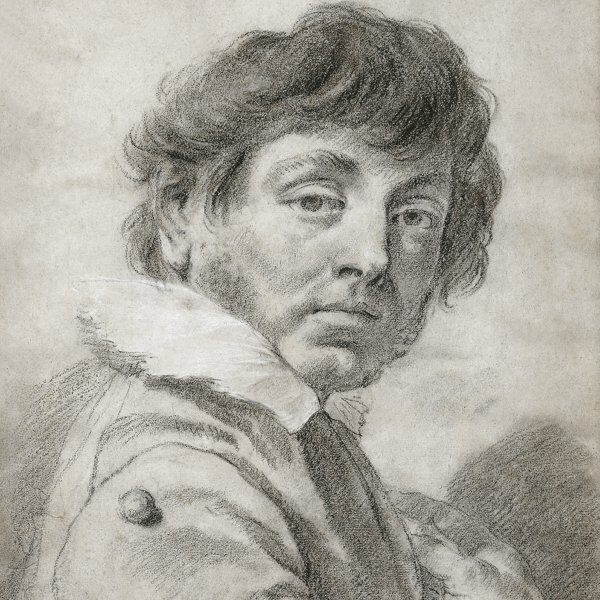 At this period Tiepolo also began to use dramatic illusionistic effects that would become a feature of his later output while deploying transparent tones, theatrical settings and a wealth of details that filled his compositions in an elegant manner. The present canvas is a reproduction of the very large composition that he painted for the church of Sant’Alvise. It repeats all the elements to be found in that oil (measuring 450 x 517 cm), which was the central image of an altarpiece with The Crowning with Thorns and The Flagellation on the lateral wings. Overall, this was an extremely dramatic composition created through the careful arrangement of the groups of figures in a panoramic setting and their gestures, movements and highly dramatic poses. 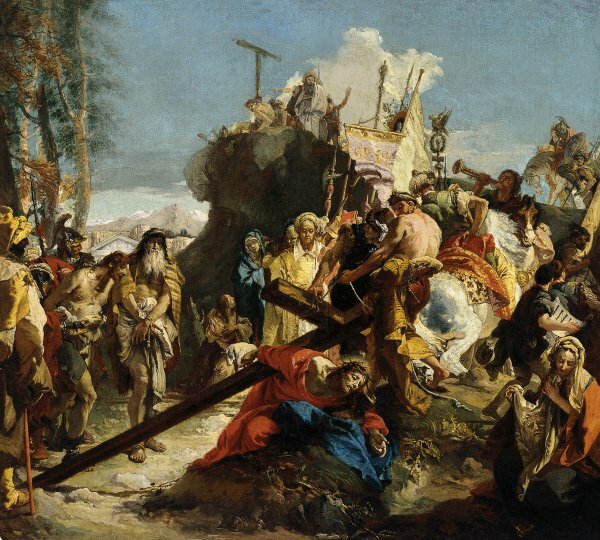 Tiepolo was inspired by the major cycles painted in Venice in the 16th century, in particular Tintoretto’s works for the Scuola Grande di San Rocco including The Crucifixion and Christ on the Route to Calvary, which Tiepolo reinterpreted for his major work for Sant’Alvise. The present canvas appeared in the catalogues of the Collection from the year of its acquisition in 1957. In 1962 Morassi expressed doubts about its attribution and in 2002 Roberto Contini concluded that it involved workshop participation. A preliminary sketch for the Sant’Alvise painting is to be found in the Gemäldegalerie in Berlin which reveals some changes with respect to the final work, for example more emphasis on the space between the groups of figures. The Berlin museum also has another copy of the composition that is similar in size to the present one. In the second half of the 18th century the present canvas was in the collection of Antoine Brentano von Birckenstock in Frankfurt, at which point it had a pair of a Crucifixion, now in the City Art Museum, Saint Louis. Christ on the Route to Calvary was included in the 1969 and 1971 catalogues of the Thyssen-Bornemisza collection as a work by Sebastiano Ricci. It was also considered to be part of a series of eight paintings of scenes from the Passion of Christ, now divided between the Musée du Louvre, the Hamburg Kunsthalle, the National Gallery, the City Art Museum, Saint Louis, the Boijmans-Van-Beuningen Museum, Rotterdam, and a private collection.